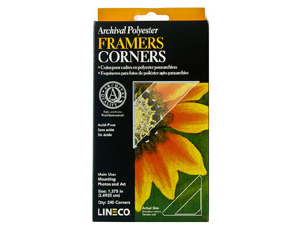 Extra-Large size 1-3/8" Transparent Mylar Framer Mounting Corners. Pressure sensitive corners virtually disappear yet firmly hold photographs on the page. Extra-Large size 1-3/8" Transparent Mylar Framer Mounting Corners. Pressure sensitive corners virtually disappear yet firmly hold photographs on the page. Backed with an archivally safe acrylic press-on adhesive.